Often as I'm working I get curious peeks over my shoulder at my various notebooks to see my sketches and what I'm working on. Working off this idea, I named my blog "Costumer's Notebook" to help share some of the design work, the challenges, the triumphs and the end results of putting together productions or projects. I've found the people really enjoy getting to see what goes on behind the scenes. "Night" brings the golden blushes and deep purples of encroaching evening. The extended length corset is a deep purple silk velvet which is hand painted with bronze. The skirt consists of 3 different layers of color; gold, iridescent lavender and deep purple shot with black. The long scarf is attached to the skirt at the waist and gracefully hooks onto the upper back of the corset or it can be worn around one arm. The style is a of blend both the Tudor style “flat front” stays with the Victorian style corsets that smooth over the hips. Back lacing with side back lace openings to allow for different hip widths. All materials (except for strength layers) are 100% imported silk. 1/4" steel bones. “Night” is a gown from a 6-part collection of original designs by Rachael Kras. Each gown derives inspiration from the spirit of a forest aspect- “Morning”, “Spring”, “Summer”, “Autumn”, “Winter” and “Night”. To the reader: Thank you for finding inspiration in these photos. Please preserve all credits for the artists involved when sharing. All rights reserved. Design and Construction: Rachael Kras | Photography: Amanda Tipton | Model: Candice Bergeron | HMAU: Meredith Strathmeyer Worobec. All rights reserved. "Winter" is a unique, extended length bodice made from long-haired velvet that gives the impression of dark, glossy ink. Silvery winter branches are woven onto a black sheer for the skirt. Black silk habotai liner. The style is a of blend both the Tudor style “flat front” stays with the Victorian style corsets that smooth over the hips. Back lacing with side back lace openings to allow for different hip widths. All materials (except for strength layers) are 100% imported silk. 1/4" steel bones. This gown is one of a kind. “Winter” is a gown from a 6-part collection of original designs by Rachael Kras. Each gown derives inspiration from the spirit of a forest aspect- “Morning”, “Spring”, “Summer”, “Autumn”, “Winter” and “Night”. Purchase this gown for $500 here. "Autumn" is constructed from a dark burnt orange silk velvet evoking the mysteries of gypsies and autumn equinox. Extended length sleeves lace at the wrist creating a soft pooling of velvet. Beaded bronze maple leaf appliques randomly cascade from the shoulders and down the back. Center front frog fastening. All hand stitched. “Autumn” is a coat from a 6-part collection of original designs by Rachael Kras. Each gown derives inspiration from the spirit of a forest aspect- “Morning”, “Spring”, “Summer”, “Autumn”, “Winter” and “Night”. Meredith "Strathmeyer" Worobec is an amazing professional ballet dancer that I've had the honor and privilege of working with since 2011. One day my friend and photographer Amanda Tipton were musing about Meredith who was pregnant. We started brain storming how we could do the most epic, ballet maternity shoot for her. We researched a ton of different maternity photos and came up with a rough idea of what we were aiming for. I created Meredith's gown with the idea of it being this combination of "baby bump/goddess/maternity/ballerina". I had several pounds of chiffon in a lemon yellow, tangerine, rust orange and scarlet. I wanted to use the oranges because I was thinking of all the energy and potential of a new life being made by one of the most beautiful dancers I've ever known. Orange also symbolizes energy, vitality, cheer, excitement, adventure, warmth, and good health. However orange is sometimes tricky against the skin so I chose to put the scarlet as the upper layer to compliment her complexion and have the orange and yellow layers flare out from underneath. I did the supporting bodice with spangled antique gold and added 'fire opal' Swarovski crystal beads. I cut the skirts for this in such a way to have the maximum amount of "fly" (movement). I named this design "Tiger Lilies & Fire Opals". 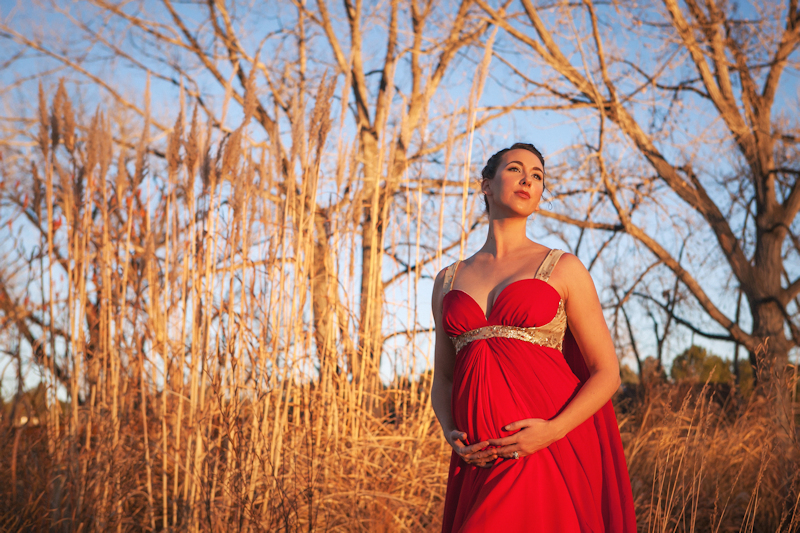 Meredith rocked her sweet 30-week baby bump in what ended up being 27 yards of chiffon in the mud and cool weather, (en pointe in ballet shoes), like the tough-as-nails career dancer she is. Overall, we wanted to make Meredith feel beautiful like the goddess we perceive her as during this very special time in her life. Amanda's immense skill with the lens perfectly captured the spirit of what we had been envisioning. I was so proud to help create this. Gown: Rachael Kras | Photography: Amanda Tipton | Model & HMAU: Meredith Strathmeyer Worobec. All rights reserved. "Summer" is inspired from the lush green of woodland forests. Green velvet is hand smocked into a leaf texture at the front. It is bound with hand-dyed raw silk. This cropped corset laces at the back and the shoulders. 10 yards of 100% silk fall from the waist and shoulders. All materials (except for strength layers) are 100% imported silk. 1/4" steel bones. “Summer” is a gown from a 6-part collection of original designs by Rachael Kras. Each gown derives inspiration from the spirit of a forest aspect- “Morning”, “Spring”, “Summer”, “Autumn”, “Winter” and “Night”. Purchase this gown for $650 here. This project was in collaboration with famed jewelry artist Andrea Li Designs and debuted along side the launch of her astonishing "Rooted" collection. These gowns debuted on the runway during Denver's Fashion Week in October of 2015 at "The Show, A Haute Couture Runway Show". The driving inspiration for the “Spring” gown was from an excerpt in Cassandra Clare’s book “City of Ashes” (The Mortal Instruments series, Book 2). Clary Fray, the main protagonist, goes to a party that includes fairies on the guest list. Flowers emerge from between velvety appliqué rib bones. Knotted raw silk ribbons weave in and out and cascade down around the body. Each cherry blossom appliqué is three dimensional with tufts of tulle and Swarovski crystal. Hand stitched and finished. Extended length corset top is constructed from a dark chocolate silk velvet flat lined on top of strong domestic coutil corset canvas. The style is a of blend both the Tudor style “flat front” stays with the Victorian style corsets that smooth over the hips. Back lacing with side back lace openings to allow for different hip widths. The skirt is made from many yards of silk chiffon layered over a silk satin charmeuse. Both are printed with an x-ray pattern of human bones. “Spring” is a gown from a 6-part collection of original designs by Rachael Kras. Each gown derives inspiration from the spirit of a forest aspect- “Morning”, “Spring”, “Summer”, “Autumn”, “Winter” and “Night”. Inspiration for this gown... Upper Right: "Floral Anatomy" by Trisha Thompson Adams. “Morning” is a gown inspired by the rising sun shining through dew-laden spider webs. It embodies the concept of morning rays piercing the cool woodlands with its radiance. The corset is constructed with layers of silver lamé chiffon that shimmer from underneath an overlay of devoré silk velvet in a leaf and branch pattern. 90” of delicate, spider-web silk (crinkle georgette) cascades from each side of the upper back to the floor in floating waves. The skirt is constructed from white devoré silk-satin in a delicate twig pattern. It is overlaid on a pure silk habotai liner in the blushing cameo pink of morning. All materials (except for strength layers) are 100% imported silk. 1/4" steel bones. Hand finished. This gown is from a 6-part collection of original designs by Rachael Kras. Each gown derives inspiration from the spirit of a woodland aspect- “Morning”, “Spring”, “Summer”, “Autumn”, “Winter” and “Night”. "... it's no use going back to yesterday, because I was a different person then." This design is a personal take on The Mad Hatter from Lewis Carroll's, "Alice's Adventures in Wonderland". I’ve always derived inspiration from the book and I occasionally discover something new with each reading. The selection of the printed script on canvas for the long jacket is influenced by a costume worn by Geoffrey Rush who portrayed the infamous Marquis de Sade in the movie "Quills". In the movie, denied pen and paper, he writes a story on his silk suit in blood with a hidden quill. It was part of my daydream to just combine elements from both stories. The lining of the jacket is made from striped pillow ticking. Cuffs and collars are French blue cotton velvet. The buttons are in the shapes of roses which hearken back to the playing cards painting the roses red in the Queen of Heart's garden. The jacket is worn over a historically accurate 18th century "stays" (corset) made out of purple satin. The top hat has a lot of detail including a Dormouse with a striped waistcoat for fun. Photographer Amanda Tipton had the idea to do the curtains like a makeshift "stage" in the middle of nowhere. It gave the character a space to be with some theatricality and separated the shoot from just a plain woodland setting. Meredith Worobec's makeup design is dark and lovely. I think it came out rather magical. Boots: Son of Sandlar's "High Boot"
Costume Design and Construction: Rachael Kras | Photography: Amanda Tipton | Makeup Design: Meredith Strathmeyer Worobec. All rights reserved.